152 mm/53 Mk162 х 2 / 6 х 1 pcs. 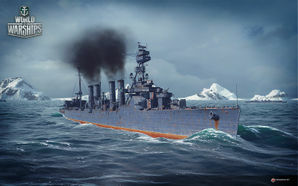 Murmansk — Soviet promo premium Tier V cruiser. A fast scout cruiser with torpedo armament built in the U.S.A. and transferred to the Soviet Navy in 1944. In contrast to Soviet-built ships, Murmansk boasted more advanced AA defenses. However, some of her guns were casemate mounted. This impractical and obsolete firepower arrangement resulted in decreased artillery performance. Murmansk was first released for sale worldwide on 30 June 2015. One of the most potent cruisers at Tier V, Murmansk is a formidable opponent in anyone's hands. Featuring a deadly gun range of 14.8km by default with its main guns, Murmansk also has the ability to carry a Spotting Aircraft ( ). Deploying this aircraft can increase her gun range by a further 20%, enabling her to out-range the majority of the ships at her tier. With torpedoes that have a range of 8.0 km, she also isn't bad when it comes to close range engagements. It is recommended though that captains use and abuse the range abilities of this premium cruiser to maximize their survival. By broadsiding at range, she can bring 5 turrets to bear on the enemy, 2 which contain double guns meaning that every 7 seconds she can hit an enemy ship with 7 shells for a total of around 60 shells a minute. With the way fires currently stand with HE shells, sitting at range and spamming high-explosive rounds is a perfectly viable option for this ship. Murmansk is an Omaha-class ship. In comparison with Omaha in the U.S. tech tree, Murmansk is basically an Omaha that has been fully upgraded. It is nearly identical to an Omaha with the C hull, the gun upgrade, and the fire control upgrade. The main difference lies with the torpedoes. Instead of firing Mark 11's, it uses Soviet 53-39's, which have a range of 8.0 km, travel at 55 knots, and inflict 14,400 damage. The reload time is higher and the torpedo firing arc is smaller, but all-in-all it's a solid upgrade. Other differences include: 2 fewer 76.2 mm AA guns, 4 additional 20 mm Oerlikon AA guns (for a net gain of 16 dps), and an even faster rudder shift time. This makes Murmansk better than a fully upgraded Omaha. Premium ships are generally inferior to any elited ship, so Murmansk is a stand-out. The only downside would be for players who prefer Omaha’s Hull (B), which has two more guns and two more triple-tube torpedo launchers, but has shorter range and loses most of the AA. Excellent firing range for a cruiser at its tier. Carries a recon plane to increase its range. One of the best AA cruisers at Tier V.
Superior to sister-ships Omaha and Marblehead in almost every aspect. Weak armor makes it susceptible to citadels. Slow torpedo speed at 55 knots. As a Premium ship, Murmansk doesn't have any upgrades to research. As a Premium ship, Murmansk comes included with Type 9 camouflage that lowers her detection radius, reduces the accuracy of incoming shells, reduces her repair costs, and increases the amount of experience she earns. USS Milwaukee (CL-5) was an Omaha-class light cruiser built for the United States Navy during the 1920s. The ship spent most of her early career assigned to the Asiatic and Battle Fleets. In 1941 she was assigned to the Neutrality Patrol until she was refitted in New York in late 1941. She escorted a troop convoy to the Pacific in early 1942 before returning to the South Atlantic where she patrolled for German commerce raiders and blockade runners. In November, she intercepted one of the latter ships, but it scuttled itself before it could be captured. In 1944 she was temporarily transferred to the Soviet Navy and commissioned as Murmansk. The ship was returned by the Soviets in 1949 and sold for scrap in December of that year. Essentially the same ship as an Omaha Hull (C), yet Murmansk has: better torpedoes, better anti-aircraft power, a smaller turning radius, quicker rudder shift, lower surface detection range, and better penetration power with her armor-piercing shells. This page was last modified on 10 May 2018, at 20:22.